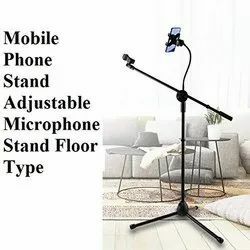 We are a leading Manufacturer of screwdriver & screwdriver set, adjustable microphone and mobile phone stand and metal long arm lazy phone holder from Faridabad, India. 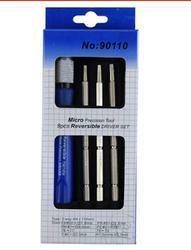 9-in-1 Micro interchangeable precision manual tool set. Light weight, compact design. High hardness and good toughness. Metal Long Arm Lazy Phone Holder Mobile Phone Flexible Bed Desk Stand Clip Holder Bracket for Iphone Huwei Samsung Stand Upgrade Quality the Mount Is Very Top Quality Processed. It Has a Glossy White Surface and Feels Very Sturdy. the Clamp Has a Foam on the Inside of the Table / Cabinet or Other Not to Scratch. the Screw Thread Is Very Large, So You Ll Be Able to Tighten the Stad Incredibly. the Arm Itself Is in Reality Very Strong So That It Can Hold Heavier Mobile Phone. Compatiable for Most Phones the Holder Fits for Most Cell Phones Such as Iphone 6, 6 Plus, 5, 4s, Universal Fitting Adjustable Clip Height,the Height of the Fixed Section Will Also Be Adjusted It Is Compatible with Most Mobile Phones and Desks of Different Thicknesses. 360 Rotating Adjustable Adjustable Rotary Deal with That Will Help You Fix Any Different Sizes of Object. Search as Table, Bedside and Chair and So Forth. Full Protection Foam Pads Non-Slip Clip: Do Not Damage Your Phone and Desk, and So Forth. Protect the Foam Pads. Your Tablet at All Contact Points Against Damage and at the Same Time Prevent the Tablet from Slipping Inside the Holder. We Will Solve the Issue to Your Satisfaction. 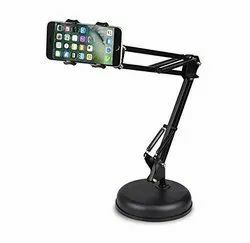 Mobile Phone Holder Stand : the Stand on Holder Is Attached to Any Desk, Bed Headboard, Chair, Wall Panel Gluing to Dashboard or Any Smooth Surface. Compatibility : Suitable for Apple Iphone or Other Android Devices from .It Is Fits for Almost All Smartphones, Iphone 7/7 Plus / 6s / 6s Plus / 6/6 Plus / and So Forth.